You guys. I have to start by saying I am so touched and encouraged by everyone’s kind reactions to my last post about why I stopped buying new clothes! I loved hearing how many of you are doing the same and I loved all the detailed questions. It just means so much to me. Truly. I was feeling pretty vulnerable about writing that post and I feel like you all responded with a hearty “Go For It!” Thank you, thank you, thank you! I will be sure to write more as the year progresses now that I know people are interested. 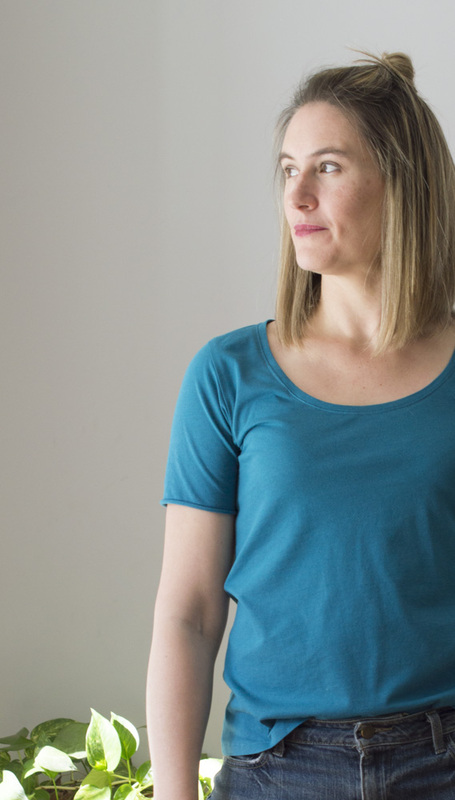 Meanwhile, I have been chipping away at my ‘make’ list and have started with t-shirts because it is first on the list for Project Sew It. Welcome to the story of the plantain tee in white, ocean and cat. Yup. Cat! You all know how much I love the plantain tee from Deer and Doe…I mean, I have made more than half a dozen versions already. It’s a top that fits me well and looks good. I love the scoop neck shape and how versatile the pattern is. 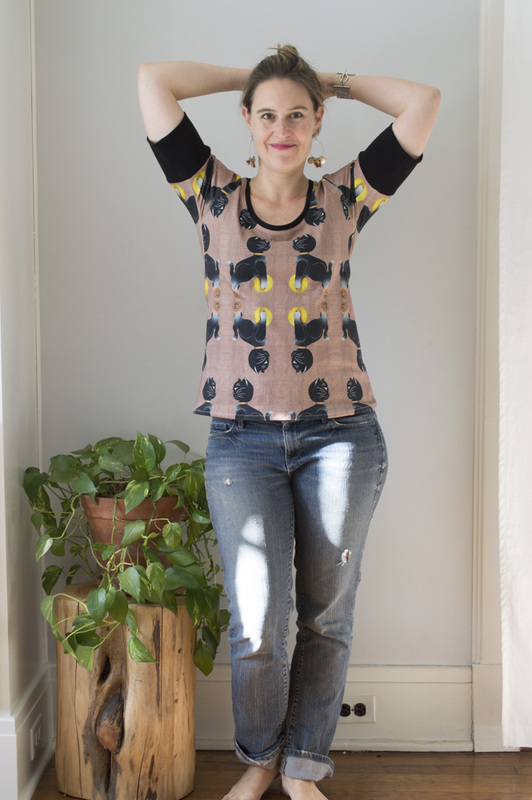 So, when it came time to decide on what to make for the January’s Project Sew It challenge, I knew it was going to be more plantain tees. And, more ended up meaning three. They are just such a wardrobe staple. There is a sort of logic to sewing three (or at least more than one) of an item. I mean, it’s just easier to do everything in batches when it comes to sewing. With a pattern like the plantain that I know will turn out great, It is more efficient to pile it on. I figure I might as well. I do make one tweak to the pattern, I did it for all three; I take out some of the looseness at the tummy. I created a kind of dart on my traced pattern, starting below the breast down to the waist level, to remove the excess ‘swing’. Then I cut the fabric. These days I feel like I almost never stitch anything straight from the pattern unless it is being sewn for the first time, there are always a few changes I like to make. I decided to stitch in triplicate because I knew I needed to replace a basic white tee in my wardrobe. The one I have is worn all the time and was getting saggy in places. 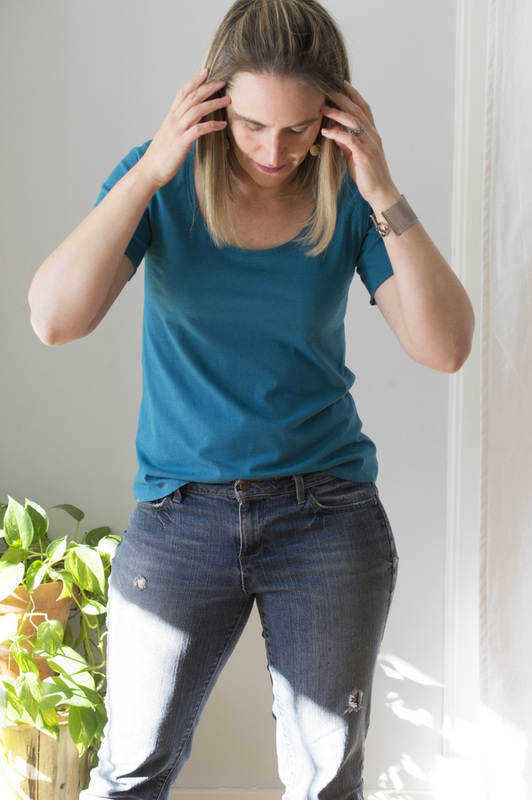 You know how worn-out tee shirts start to lose their elasticity and get droopy? This shirt is headed to droops-ville, which in my case means it’s about to become a pajama top. Ha! I managed to find lovely white fabric at Imagine Gnats, a laguna knit, so I was all set to make the replacement. 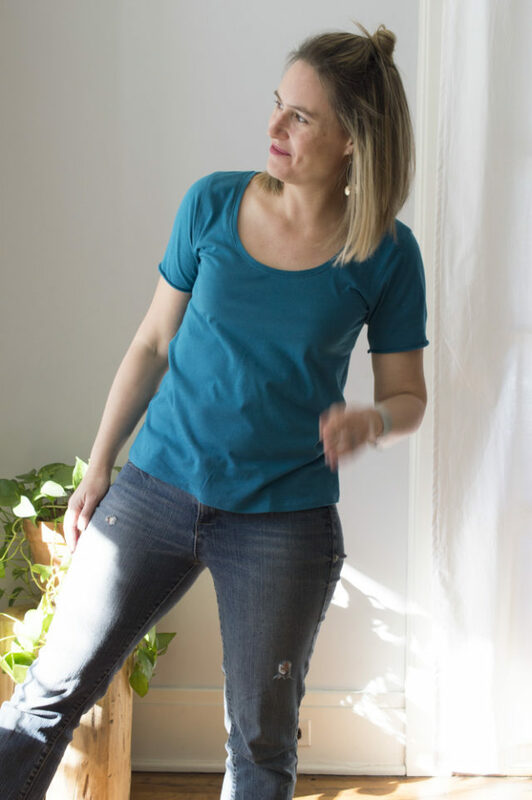 While browsing Rachael’s shop I also fell in love with this ocean colored dana knit and I knew it needed to be a short-sleeved tee. I’m not sure there is a color I love more than this one. I left the hem of the sleeve a raw edge because I liked the look. Amazingly, the width of this fabric is wide enough that I could eek this t-shirt out of one yard! 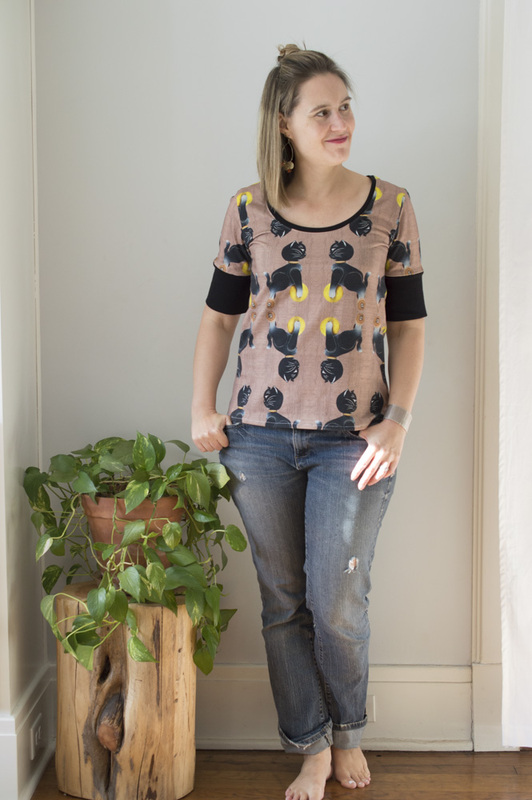 That makes this gorgeous tee a $14 bargain! Score! Once I was making two t-shirts I hunted in my stash for what I had to make a third so I could get my efficiency on. I impulsively decided to also use fabric I have been hanging onto for a long time. It’s time to use up what I’ve got!! I’ve long thought of this knit as rollerskating cats but realized quickly it is actually a rolling cat toy. I don’t know if that is better or worse. But, in either case, I now have it as an adult shirt in my wardrobe. Wear it proudly, right! I added a black cuff on the sleeve and neckband for a bit of interest. Though, I suppose, ‘interest’ is not something this top lacks. The colors say sophisticated but the rolling cat toy design says juvenile and the truth is I kind of like it! I also can’t remember where I bought the fabric. Sorry about that. Anyone recognize it? I will definitely wear my cat pull toy shirt. Perhaps not as much as the ocean and white tees but It’s playful and my life needs more of that. So, there you have it. I ticked some wardrobe basics off the old checklist. The year of sewing my own clothes is off to a good start. Great basic and not so basic Ts! I especially love the cat toys. 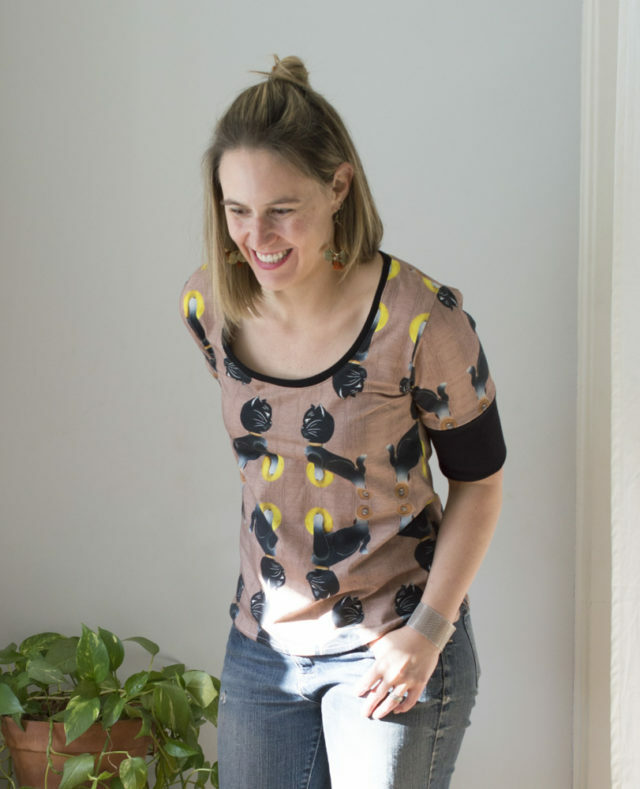 I too have a cat shirt, and interestingly enough, people often ask me if I like cats – while I’m wearing the shirt. What’s with that? Ha! I see a surprising amount of cat-themed clothes out there. We are not alone! They are all wonderful and look great on you. Love the cat fabric! These are all such wonderful basics! 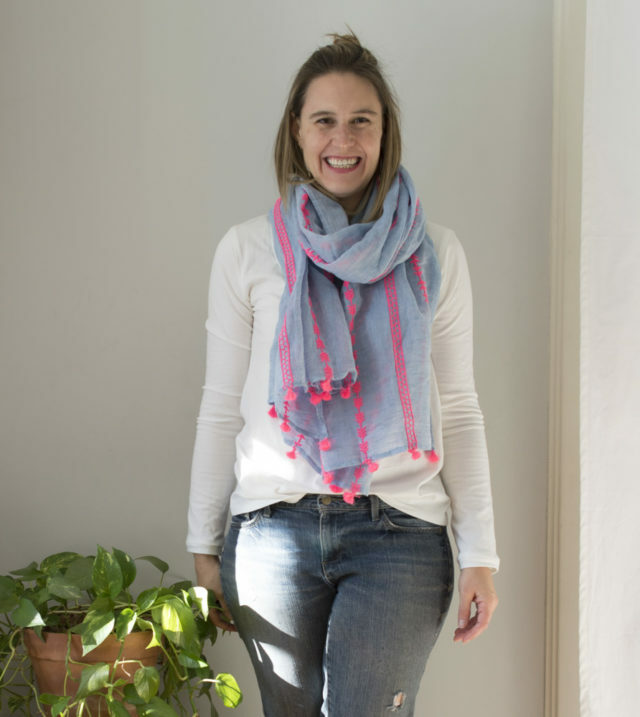 I love that you’ve found a pattern that works so well with your style, but that even though you have so many they all look different. They’re super flattering!! Thanks Meghann! It is so nice to have a tried and true t pattern. What a good eye you have! 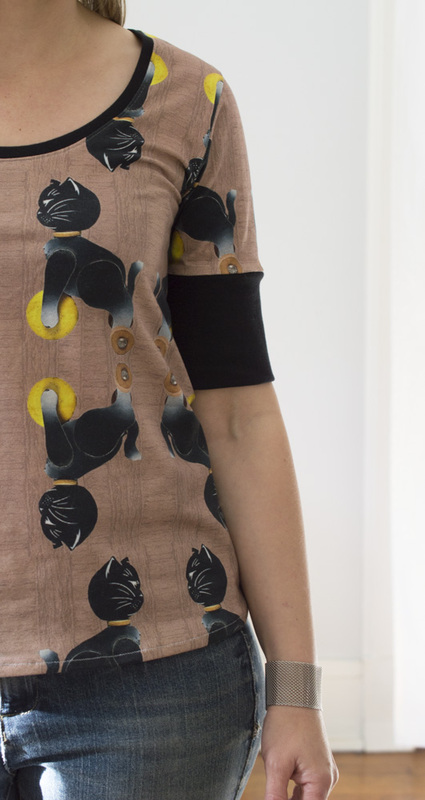 The cat fabric in those colours is exceptional, and the black neckband and cuff make it look sophisticated designer. Love it. Darling! I just made my first plantain and with a couple tweeks looks to be a favorite. You did a great job. Do you mind… what size did you cut? Other than the looseness in the swing, did you make any other changes? I’m a size 40. Can’t wait to see yours!! !